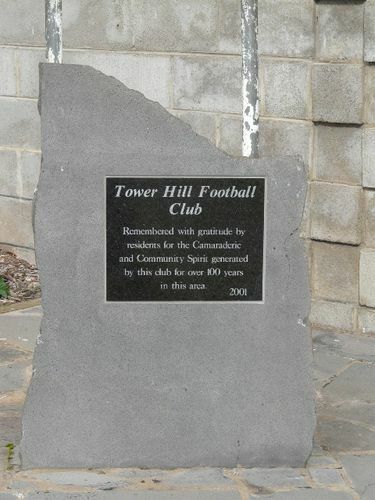 A monument commemorates the Tower Hill Football Club and its links to the local community for over 100 years. Originally known as the Killarney Football Club, the name was officially changed in 1877. At first football was played on a paddock belonging to a Peter Madden in Killarney - later at the "MCG" ("Mahoney's Cow Ground") in Killarney . Tower Hill Football Club wore red and black jumpers. Vin Shanley recalls that they trained at Crossley (the ground-site now paddocks). They played against clubs from Port Fairy, Koroit, St Joseph's Warrnambool, Hawkesdale, Yambuk and Dennington. He recalls that "Daley's Groceries and Hardware" store would run a motorised bus which would cart goods around during the week and transport the footballers on weekends. In Vin's era they were premiers in 1921 and grand-finalists in 1923.